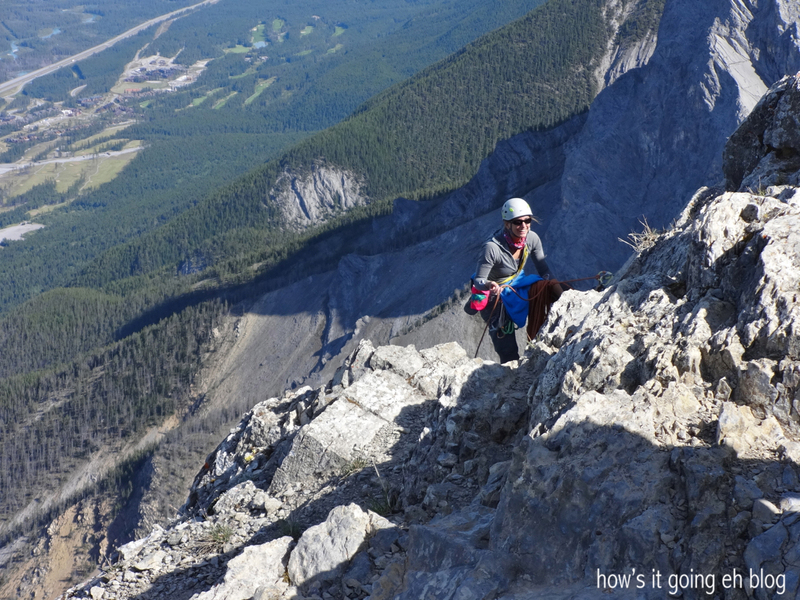 Ha Ling Peak – Canmore | how's it going, eh? Cross Ha Ling Peak off my list of hikes!!! Sensational, wowee zowee, insane hike! Check it out! 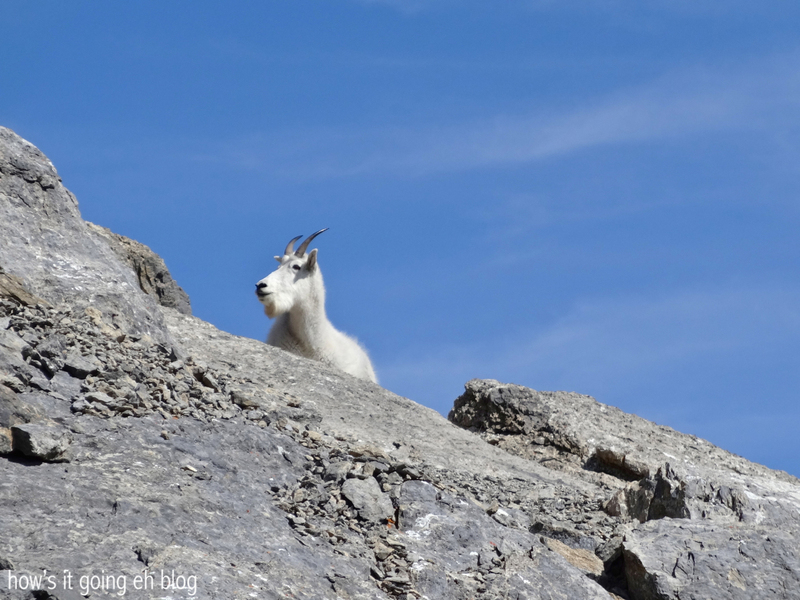 I’ve always wanted to hike Ha Ling Peak. 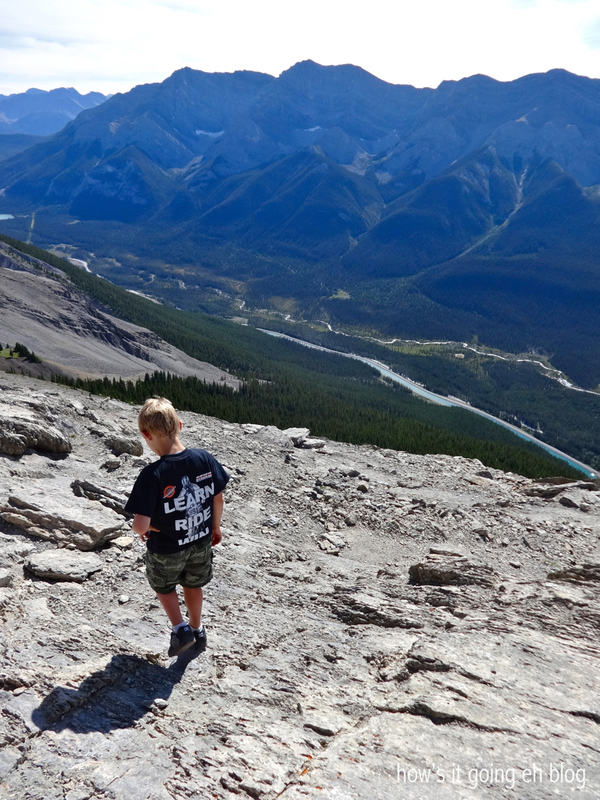 Last week my brother-in-law + sister-in-law + two nephews were in Alberta for a short trip. 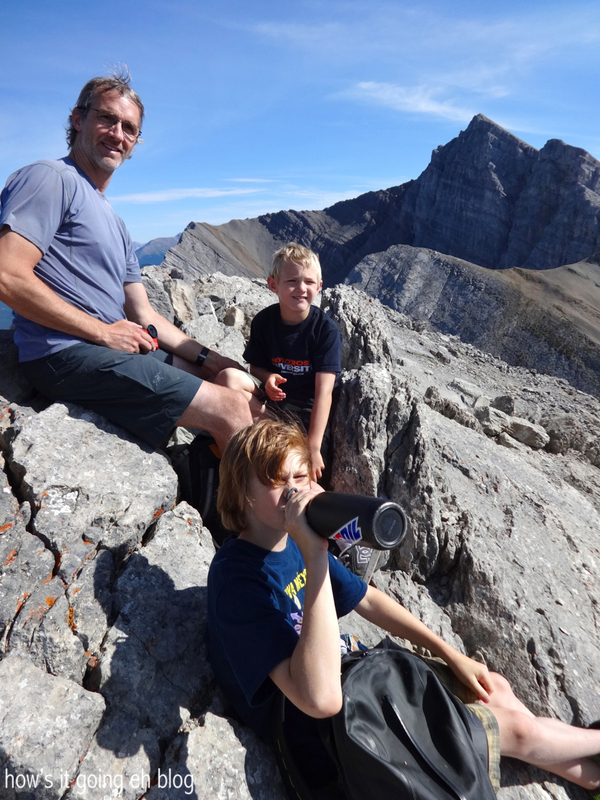 Tom + Deb used to live in Canmore in their youth + this was the first time experiencing the Rockies with them! 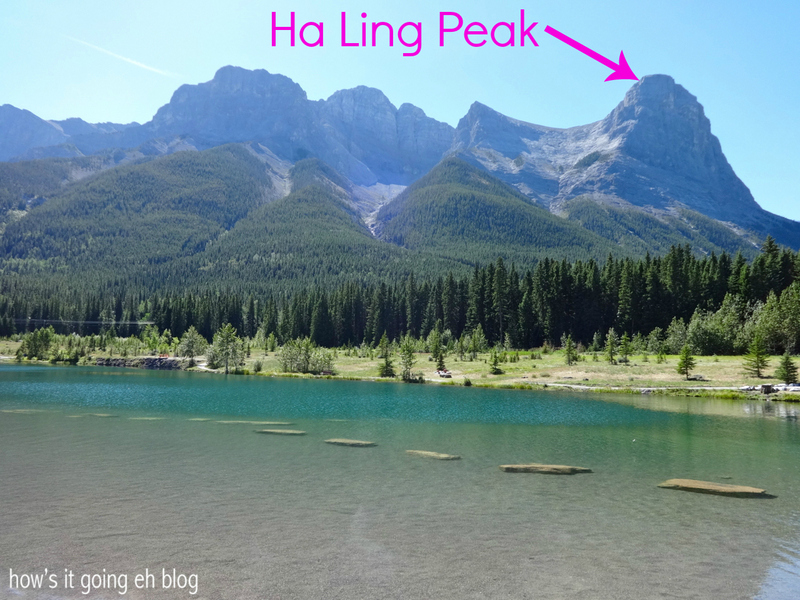 I was really excited when they suggested Ha Ling Peak + then the hot afternoon wore on + then I was less excited. 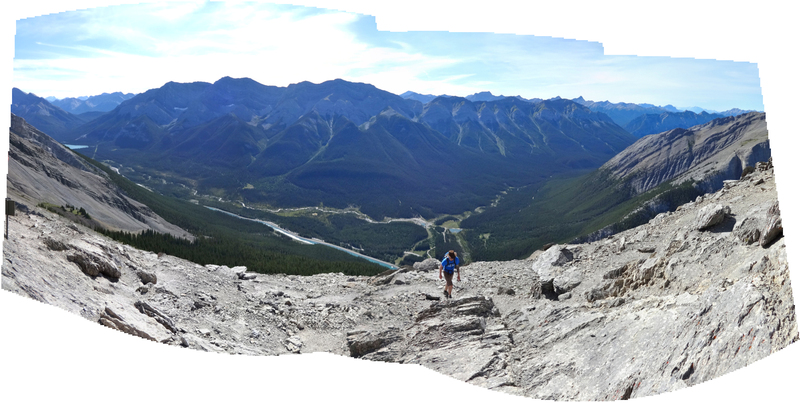 Here is the peak, shot from the Quarry, a goooorgeous Canmore swimming hole that’s perfect for kiddies + sun bathing moms. Yeah, I was on the top of that. 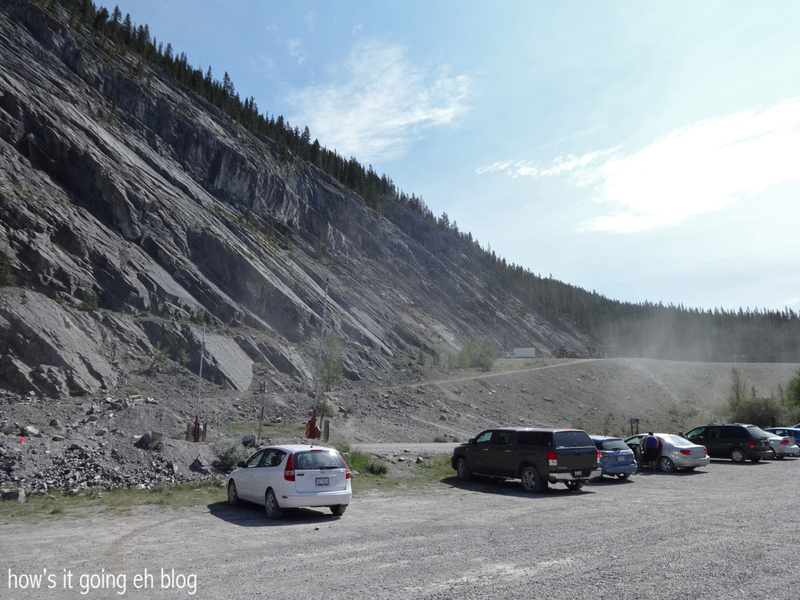 But then, when we were winding up the road towards the trail head, I got a little more excited as my nephews + I were busy chewing gum + blowing bubbles in the back seat. 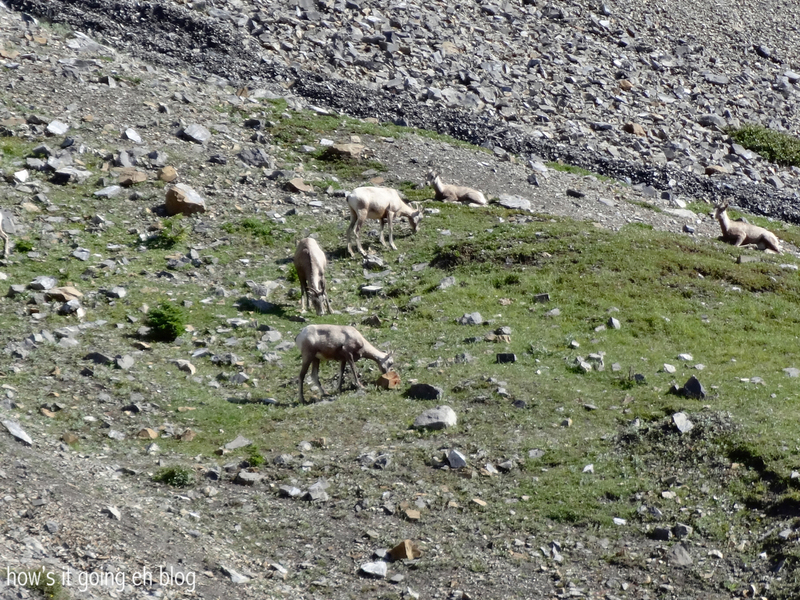 Oooh, lookee baby bighorn sheep + it’s mama!!! LOOK THIS WAY, BABY!!!! Ah, oh well. The parking lot to the trail. Dusty, hot + if you look to the left, you will be hiking up into that forest. Ha Ling Peak was formerly known as Chinaman’s Peak. In 1997 the name was officially changed because…wellll….isn’t it obvi??? 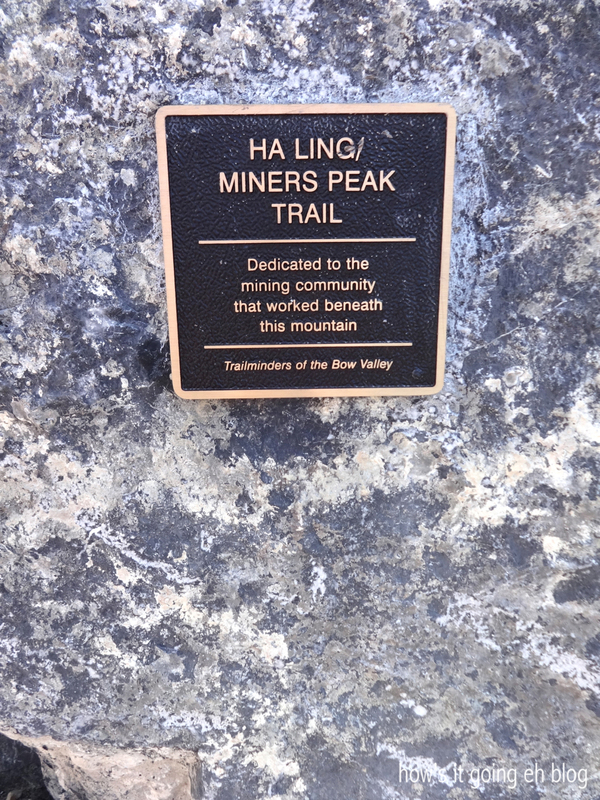 As the story goes, in 1896 Ha Ling, a cook for the Canadian Pacific Railway was bet $50 by the miners in town that he couldn’t climb the peak in under 10 hours. 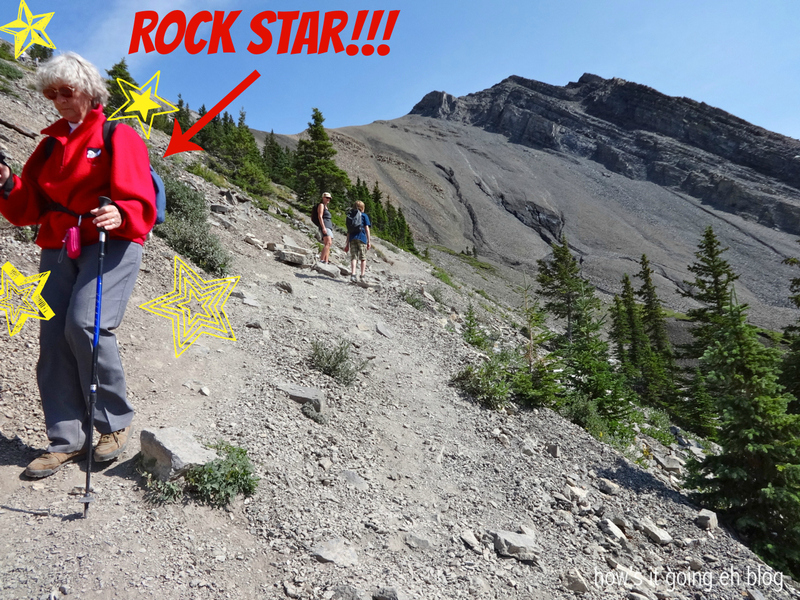 He ascended, planted a flag at the summit + was down the mountain before lunch. Haters gonna hate, because after many doubts of Ha Ling’s accomplishment, he led the skeptics back up the mountain + planted a much bigger flag that could be seen from town ( must’ve been REALLY BIG) next to the original. And that, my friends is why the peak is named in his honor. The End. Nay!!! It’s only the beginning!!! 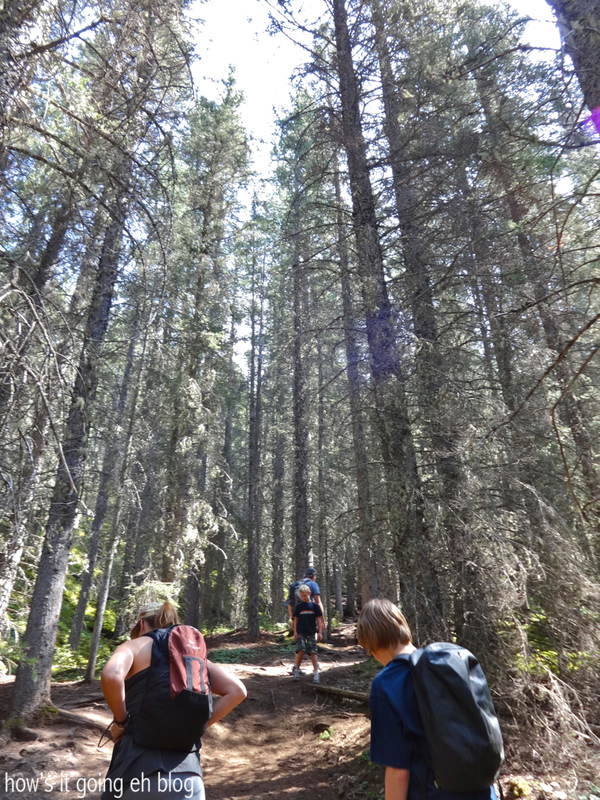 The majority of the lower portion of the hike is wooded + provides much shade. I just want to say that I’m eating a Nanaimo bar right now + feeling very Canadian about it. Nanaimo bars are a Canadian specific sweet. More on that later. Sorry, ADD moment. No joke. I had to keep stopping + Deb + Matt were so encouraging – patiently waiting for me + not letting me give up when I would say, “Go on without me, really.”. Let me tell y’all that it’s 2 hours (going slow) of straight uphill!!! 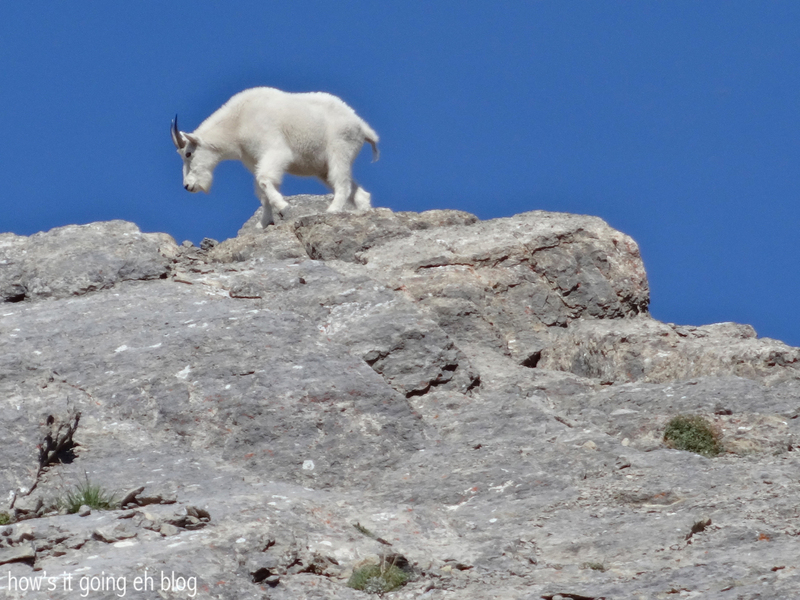 Once we broke the treeline – which I was praying would be around the next bend, we crossed paths with this gal, who was hiking like a BOSS!!! Okay, I stopped feeling sad for myself + was immediately renewed!!! 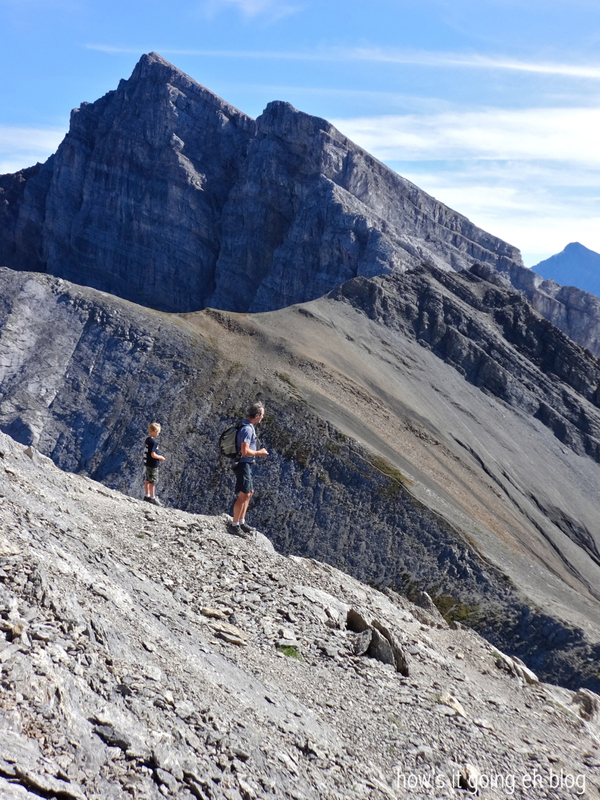 TIP #1: this is a hike that I would really recommend hiking poles because it is mad steep + there is mad slippery shale!!! Yo, check it! 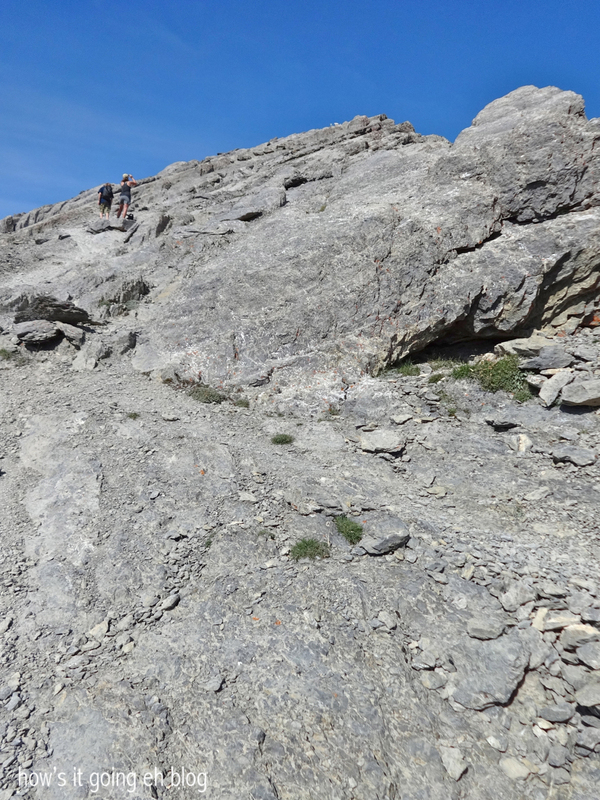 I thought the shale at Edith Cavell Meadows was bad – that was Romper Room compared with this slippery, crumbly path! SO FLUFFY!!!! I wanted to grab it + bury my face in it’s pure, white fur! But I thought against it because I didn’t want a face full of hooves. 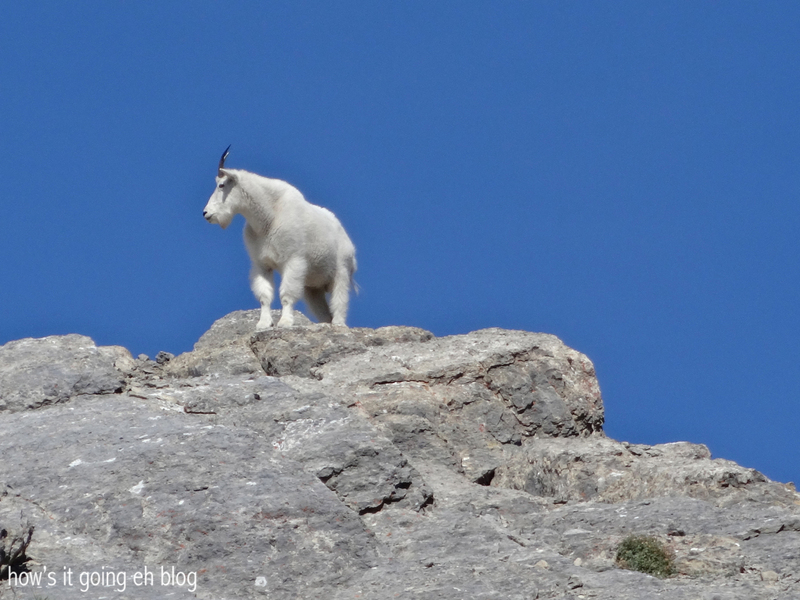 Deb said she’s never seen a mountain goat so close up on a hike before! That’s saying a lot because she’s been on a lot of hikes! Lucky us!!! Tom! Matt! Tobin!!! So close, yet so far away!!! Success!!! TIP #2: bring TWO bottles of water, because you are going to be wanting all that hydration – believe me! “Look over the edge” Tom told me. Oh! Hello!!! Dayum. Two rockclimbers coming up. 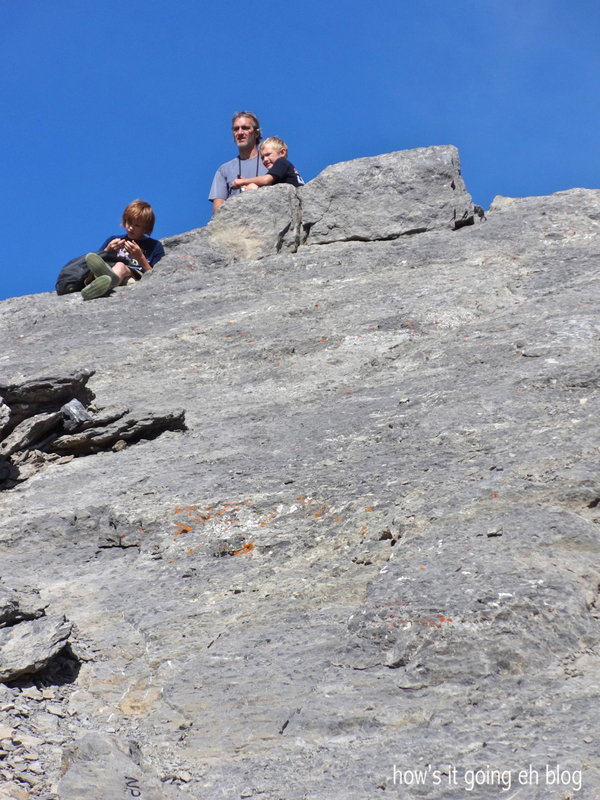 My brother-in-law Tom has climbed up Ha Ling Peak WITHOUT climbing gear. No ropes, nothing. That’s called soloing or solo climbing. That’s called badass. 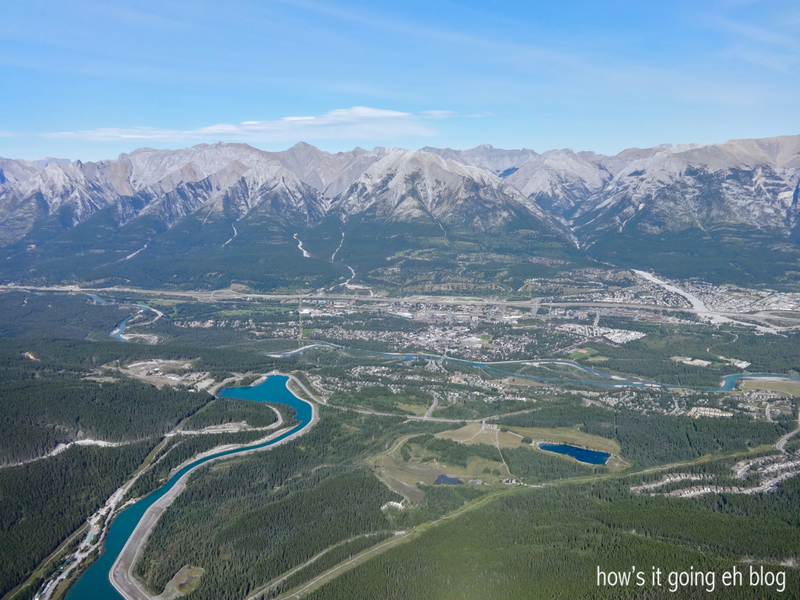 View of the town of Canmore. After snacks + water we headed back down. Tom + Tobin look like they’re looking out onto a different planet!!! Crazy, eh?! 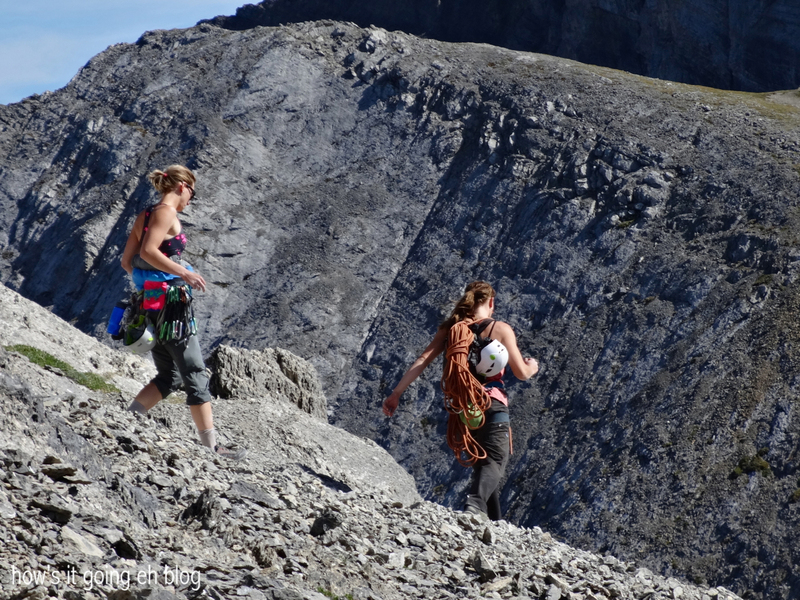 I was treading very carefully + slowly down the steep trail + la dee da here comes the rock climbers racing down! Envious. They have such great arms too! I slipped about half a dozen times + each time I would exclaim, “Woah!!”. 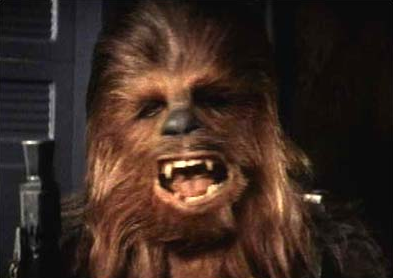 Actually, it was more guttural + I sounded ike Chewbacca + it came out more like, “WEROOOOREHW!!!!!. Again, this is where the hiking poles would come in reeeeal handy. 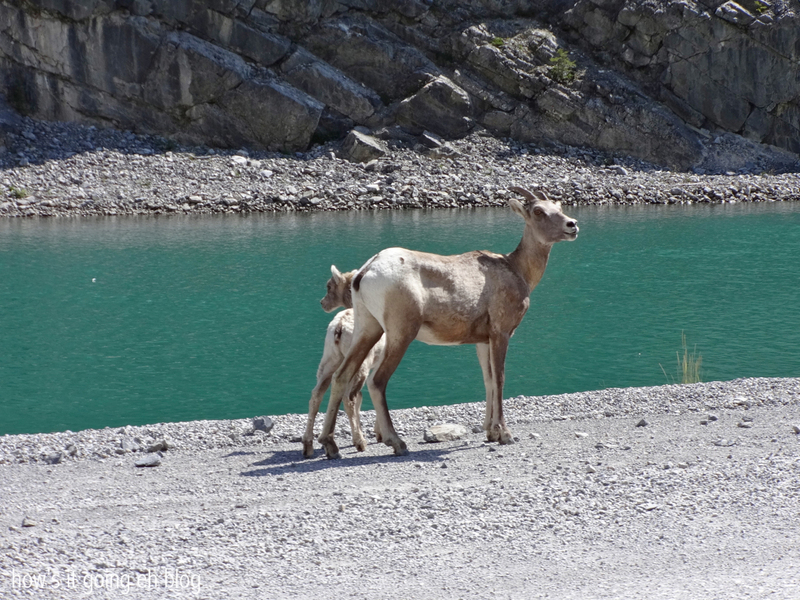 Hi female bighorn sheep! Downhill is almost as killer as uphill because your quads are burning + you have to use a lot of control because of the steepness. I was sore for days after!!! TIP #3: stretch after!!!! I’m sooooo glad my family encouraged me up the hill! Oh, + if you’re wondering why Jeff was absent on the hike, it’s because he was slaving away at work while his very lucky wife (me) was enjoying the outdoors. I’d like to go back up again + take more pictures – I was too bagged out to really take advantage of where I was!!! It was such a beautiful view + all worth it! When you’re taking your time, it’s about a 4 hour hike round trip! Bagged oooout! I like how the Canadian-isms are starting to slip into your speech! That chewbaca picture had me laughing, you’re too funny Shelli! Miss you, love you! P.s., how old was Matt (he’s Jeff’s younger nephew, right?) when he started hiking without the baby backpack? Can’t wait till Solly is ready to hike one day! I know, aren’t they getting big?!?! I know! Watch out, next time I see you I will be speaking fluent Canuck! Miss you, love you too!!!!! Thanks Deb! I’m so happy I got to experience the Rockies with the Canmore Originals!!! Let’s make nanaimo bars when I get back to Vancouver! Thanks for this – the best description w photos I’ve found. I hope our day is as awesome as yours was! Oh great!!! Thanks so much! It is an amazing + gorgeous hike! Bring lots of water! Happy 2014!!! | how's it going, eh?